The Lysian Central Command is a bulky space station. Its armament, however, consisting of four laser cannons and several cobalt-fusion warheads, is very limited. 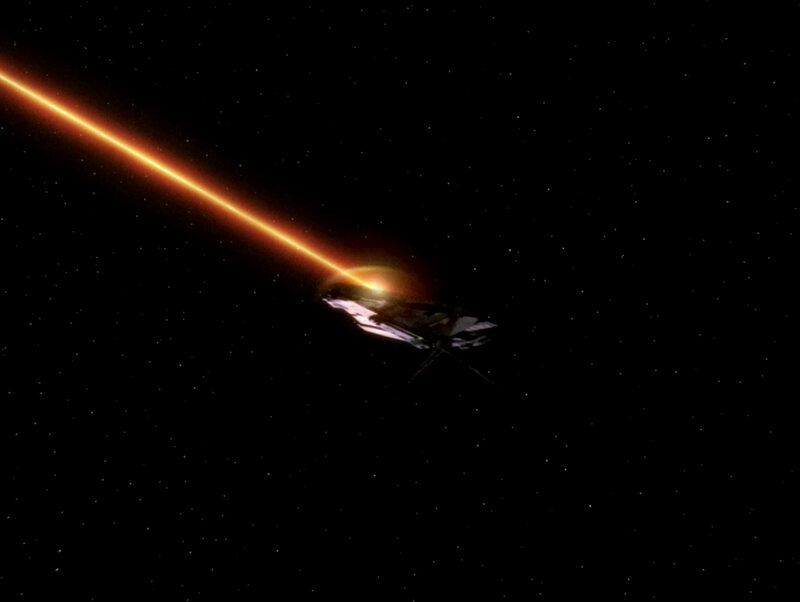 The Enterprise crew almost destroyed the station while under amnesia and misled by a Satarran agent in TNG: "Conundrum". Although the miniature is a redress of the Edo god from TNG: "Justice", it is obvious that it must be a completely different design. Although the lighting was not changed in essence, the Lysian version looked a bit less outlandish because is was not that excessively illuminated. The Lysian destroyer is a warship armed with light short-range weapons and minimum shields. The Enterprise crew destroyed one of these vessels while under amnesia and misled by a Satarran agent in TNG: "Conundrum". The model of the destroyer a modification of the Talarian warship and might be the same basic design. The model was filmed upside down, therefore the side view is flipped likewise, although it looks odd. The sentry pods are unmanned and armed with laser cannons. The Enterprise crew destroyed several of 47 of these pods while under amnesia and misled by a Satarran agent in TNG: "Conundrum". The Erstwhile seems to be a ship of the versatile Antares class. The Erstwhile (TNG: "The Outrageous Okona") is a modification of the Batris from TNG: "Heart of Glory". The modifications are extensive enough that it could be of any other class, but it would be no problem if it belonged to the same starship family. The miniature with apparently the same modifications was also used for the Ornaran freighter Sanction in TNG: "Symbiosis" (see below). These two ships can be easily of the same design. 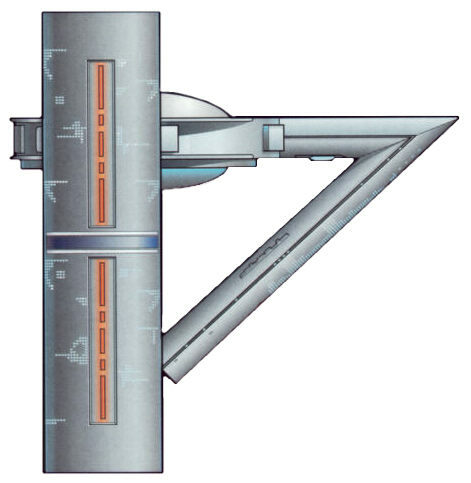 Since even the Federation freighter Arcos (Deneva class) is of this design, we may conclude that the Erstwhile may have been been a Federation ship that was sold to Okona and kept its name. It is the most plausible explanation that Okona is not human but rather of the same race as the inhabitants of Straleb and Atlec (considering that he was supposed to be the father of Yanar's child). This is why his ship is listed here. 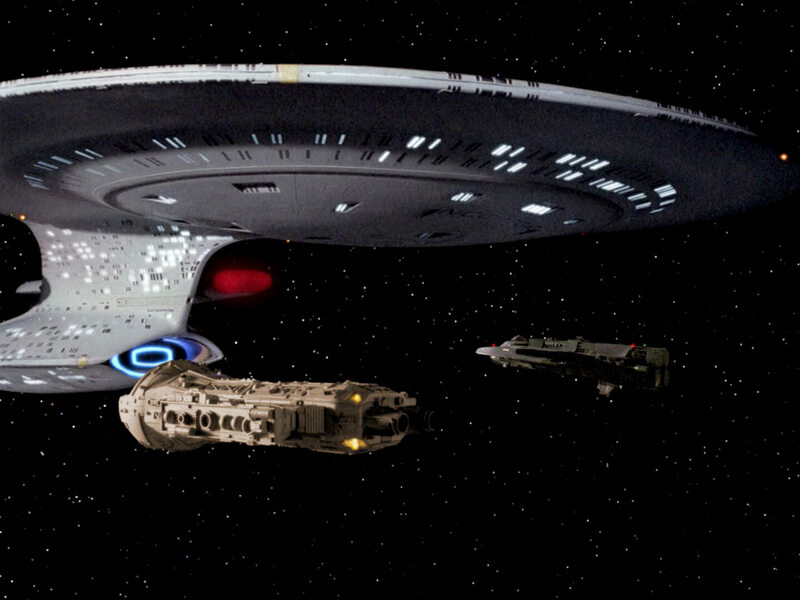 The Erstwhile appears to be at most a third as long as the Enterprise-D. Maybe the sizes of all related ships (Batris, Erstwhile, Sanction) should be modified accordingly some day. The Atlec use this type of vessel which is both considerably smaller and inferior to the Enterprise-D. The Atlec vessel is a re-use of the versatile Merchantman from "Star Trek III" without visible changes. It would not be too far-fetched to assume that the Atlec, like many other races, may have acquired vessels of exactly this type. The ship looked rather smaller than 150m compared to the Enterprise, though. The Straleb use this type of vessel which is both considerably smaller and inferior to the Enterprise-D.
Rick Sternbach designed this ship which was then built with several modifications. It is the original appearance of the miniature which will later be modified to become the Angosian transport. Engineers on Malcor III are working on this ship to break the warp barrier. It is uncertain if the warp ship is still being built, considering the political turbulences following the premature contact of Malcor III with the outside world. Anyway, a model of the vessel and depictions on computer screens were visible in Mirasta Yale's office. Mike Okuda about the design: "My recollection is that I designed the Malcorian ship desktop model, but it is possible that it may have been Rick, who designed most of the ships and props... I think Ed Miarecki built it for us. Don't know what happened to it... I know I did the animated computer readouts in the lab. A big silkscreened diagram of the ship also appears on a clear acrylic display in the lab. Yes, it was specifically done for this episode, although the model did later appear as set dressing in another episode." Rick Sternbach tell us: "I think I did a few doodles or 3D computer model roughs of this one, based amazingly vaguely on a mashup of a Bussard ramjet and an Enzmann giant deuterium fuel tank starship. I do believe Mike added the warp nacelles and offset them from the center framework, which may have hinted at the possibility that warp physics was similarly discovered and refined by separate cultures." The Malurian ship is superior to the NX class, equipped with several weapon platforms and a shielding system. 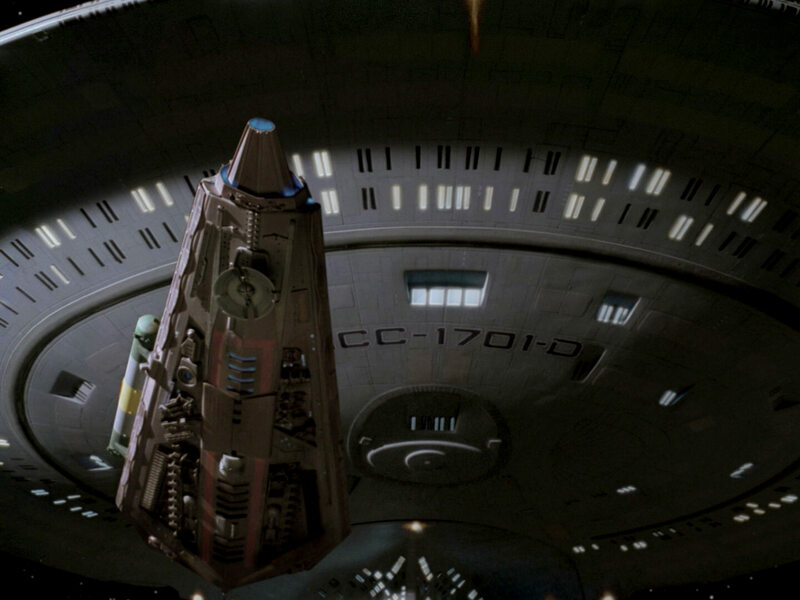 The ship was designed by John Eaves and appeared in ENT: "Civilization". All life in the Malurian star system will be extinguished by Nomad in 2267 (TOS: "The Changeling"). No details are available on this shuttle. 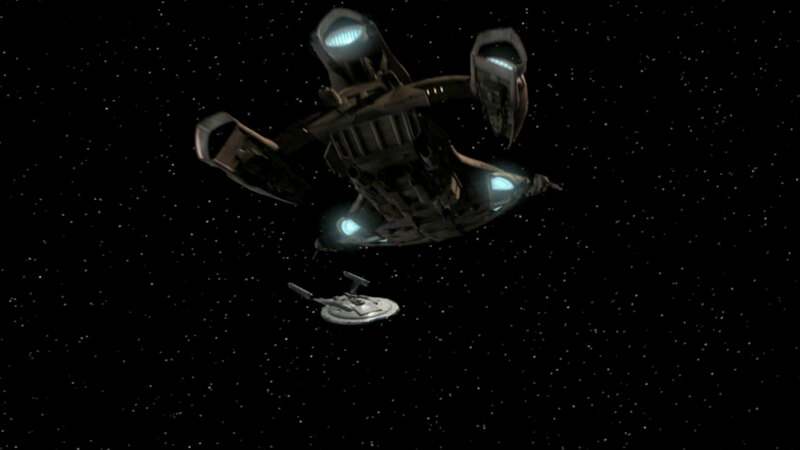 Like the Malurian ship, the shuttle appeared in ENT: "Civilization". Mazarite ships are equipped with energy shielding and with weapons that are efficient also at warp. 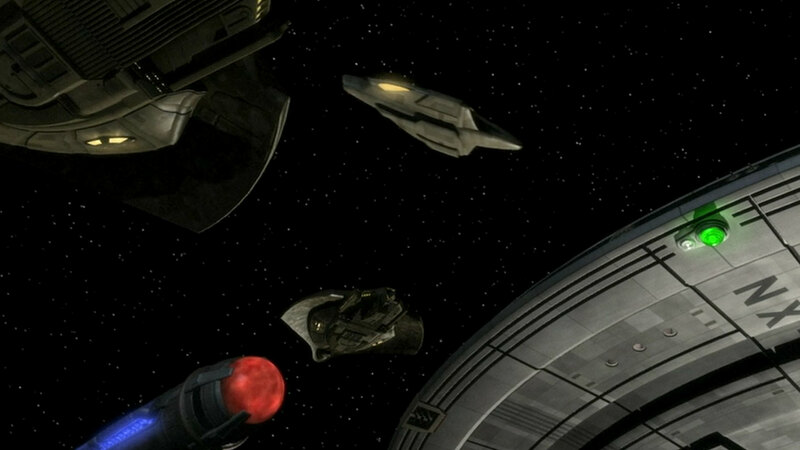 Three of these ships were in pursuit of Enterprise in ENT: "Fallen Hero". 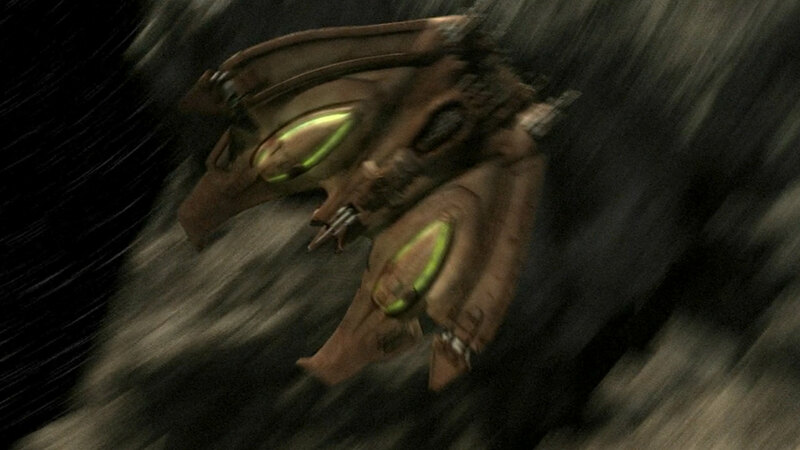 It is noteworthy that the top part of the Mazarite ship with the wings, although it is CGI anyway, is an almost exact replica of a Romulan D'deridex. Also, the yellow grilles on either side of the central deflector are the impulse engines of the Intrepid class. 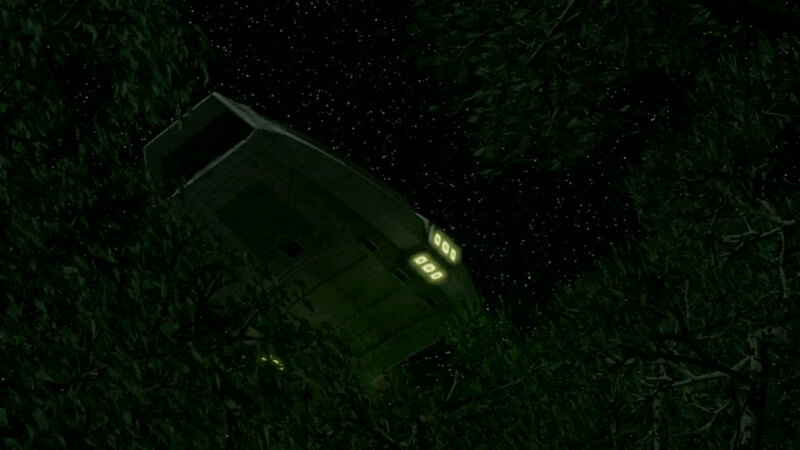 One such shuttle appeared in ENT: "Fallen Hero". The buoy warns ships from entering Melkotian territory. It rotates and keeps changing its color. The buoy was seen in TOS: "Spectre of the Gun". 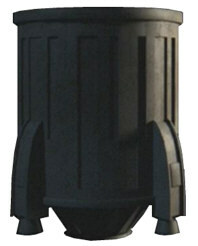 The CGI model of the buoy built for the remastered episode has the a similar basic structure and is semitransparent too, but has been visibly redesigned. 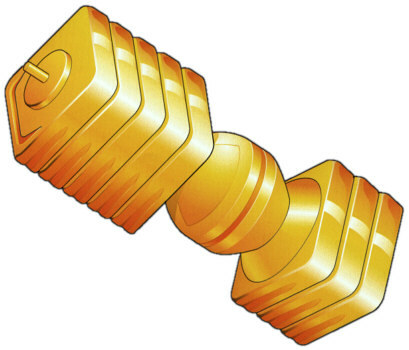 This weapon was created by the now extinct arms dealers of Minos for the ancient Erselrope Wars. The Echo Papa 607 is a free-flying automated weapon system for planetary and orbital operation. The weapon's response is adaptive and may be improved through learning to be more than a match even to a Galaxy-class starship. 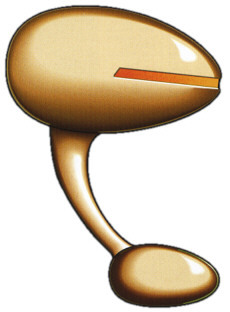 The designation "Echo Papa" is odd for an alien weapon that was never supposed to be sold to humans. But it may have been a creative translation of something like "EP" in the alien language. The unit that attacked the away team was only about 50cm tall. 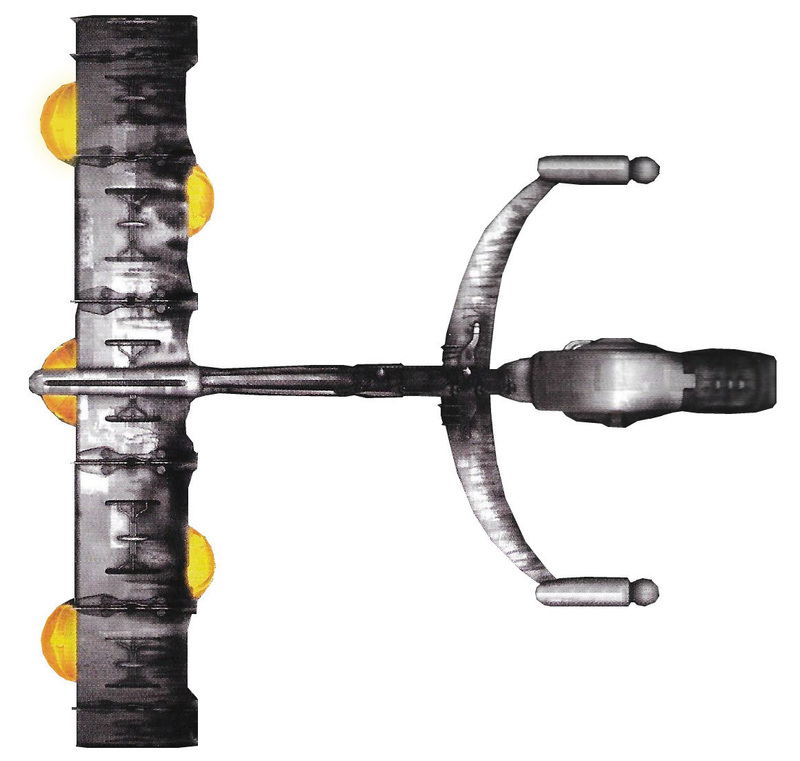 The weapon in orbit, which almost managed to destroy the Enterprise, may have been an identical unit. But where would propulsion, control, weapons and, most of all, energy be in such a tiny device, smaller than a photon torpedo? Maybe, as it was not acting completely autonomously anyway, it was receiving an energy transfer from the planet? A perhaps better explanation is that the Echo Papa 607 in orbit was much larger (it looked like that in most takes). Since it was demonstrated and had been sold as an all-round planetary attack and defense system, there is no need that all of its components would be identical. This type of fighter is superior to a Federation runabout. 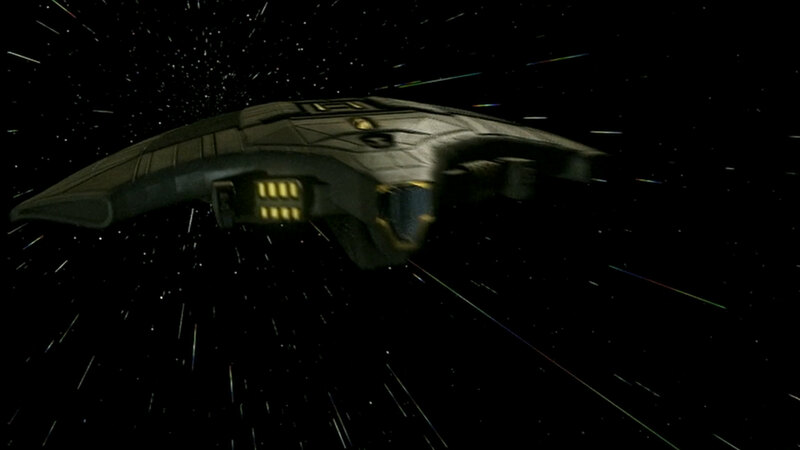 The ship appeared in DS9: "Vortex" as a new model, designed by Richard Delgado. It was manned by the Miradorn twins Ah-Kel and Ro-Kel who lived in a symbiotic relationship, and the ship may have been laid out for that. The name "Theta class" mentioned in the episode may be a human/Starfleet designation or a coincidence. The color of the model is gray-blue, probably with several greenish panels. But in most scenes it appears to be just plain gray. Nausicaan pirates are using this small type of vessels to attack freighters. The ships are armed with fore and aft plasma cannons. Their shields wouldn't hold up to spatial torpedoes. 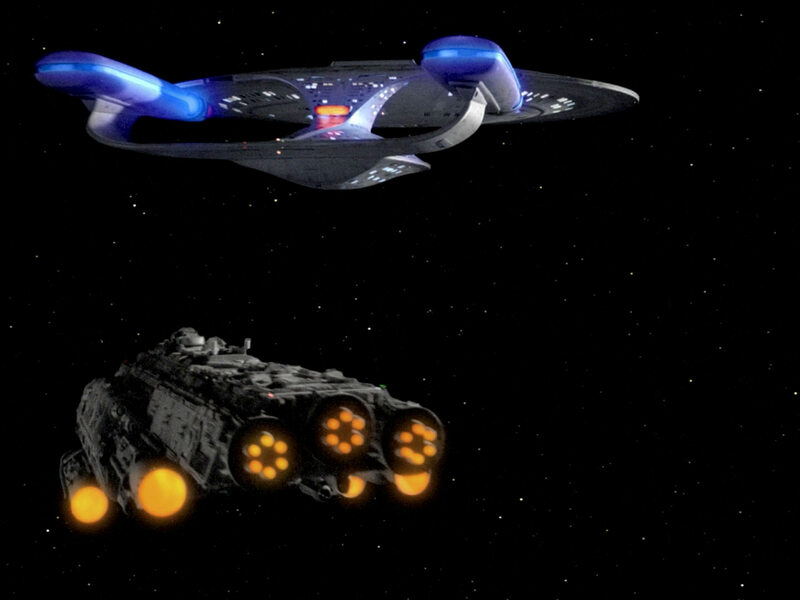 Three of these ships appeared in ENT: "Fortunate Son". Ships like these are used by the Orion Syndicate in the 22nd century to raid alien ships and abduct crew members as slaves. They are equipped with transporters. 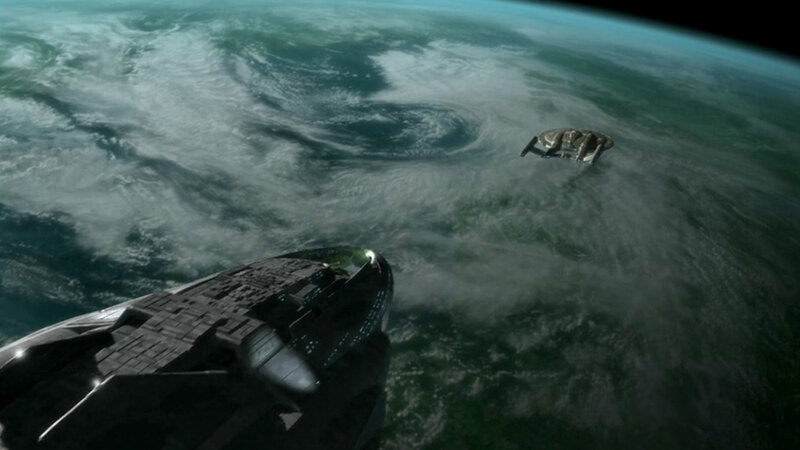 The green ships with their obvious bird-like features could be seen in ENT: "Borderland". Although there is no canon evidence, it almost seems that the Orions, Klingons and Romulans have been exchanging technology for a long time. The very small and extremely fast ship is equipped with a powerful weapon system. 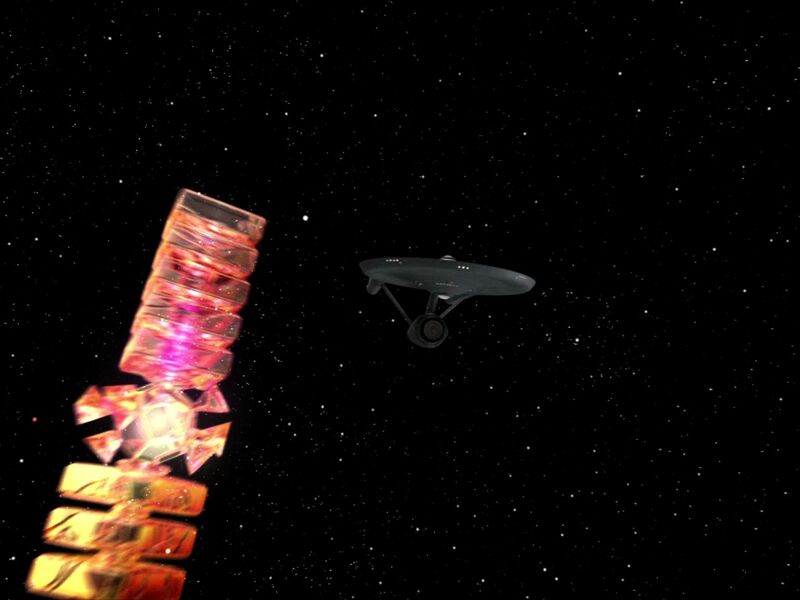 The Orion vessel was seen as nothing but a light in TOS: "Journey to Babel". Maybe this is an effect of their propulsion system, or it could be a crude cloaking system to avoid the ship from being precisely targeted. The ship was reportedly faster than Warp 10. 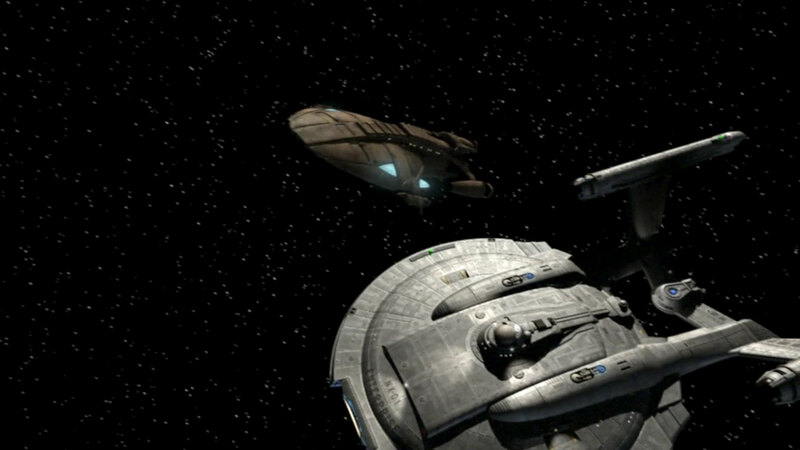 For TOS Remastered a relatively detailed CGI model of the ship was inserted into the scene. 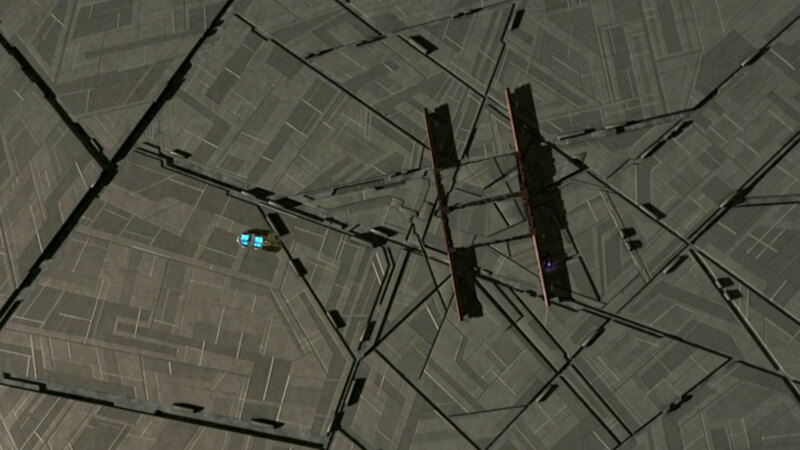 Its engines which are arranged in a circle roughly produce the same effect as the spinning light in the old episode. This vessel is considerably smaller than a Starfleet NX class, but has at least equal fire power. It is also equipped with a grappler. 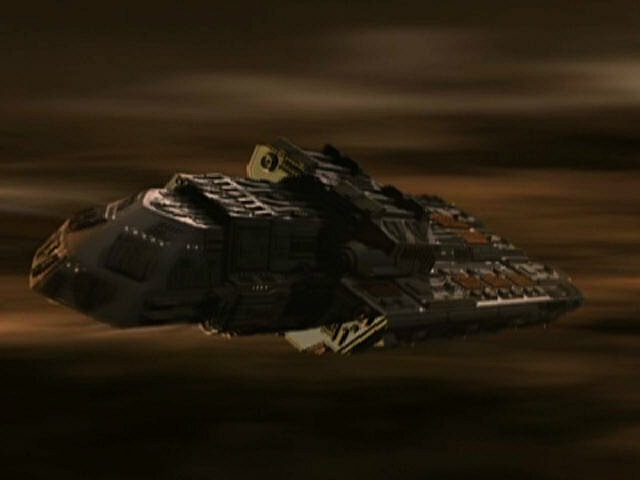 The vessel was featured as Harrad-Sar's ship in ENT: "Bound". It is a new model, and also said to be of "unknown configuration" in the episode. The Ornaran freighter seems to be a ship of the versatile Antares class. The Ornaran freighter (TNG: "Symbiosis") is a modification of the Batris from TNG: "Heart of Glory". The modifications are extensive enough that it could be of any other class, but it would be no problem if it belonged to the same starship family. 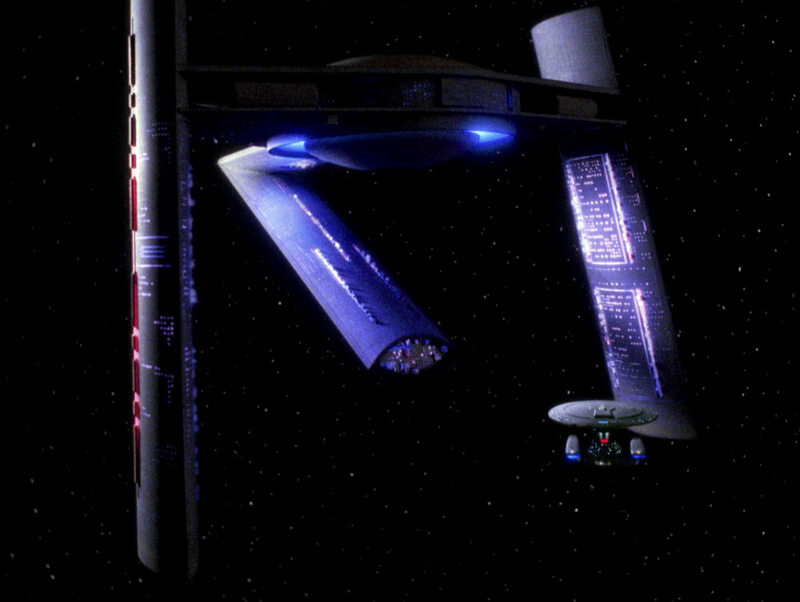 The miniature with the same modifications was also used for the Erstwhile in TNG: "The Outrageous Okona". These two ships can be easily of the same design. Since even the Federation freighter Arcos (Deneva class) is of this design, we may conclude that the Sanction may have been been a Federation ship that was sold to the Ornarans and kept its name. The particular Osaarian ship is heavily armed and shielded with trillium-D against the effects of the Expanse, which is not a standard among their race who usually operate their merchant fleet outside the Expanse. The ship's hull is made of polyduranium. 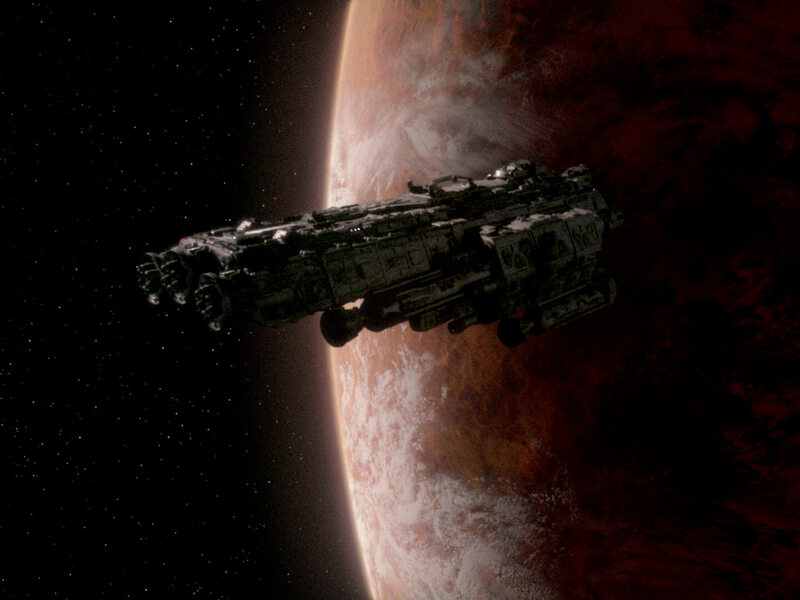 The ship appeared in ENT: "Anomaly". It was mentioned that its hull, just like the porthole in the sphere, consisted of polyduranium. While the 1000-year-old sphere itself was definitely not built by the Osaarians, they may have added the door. On the other hand, the door looked just exactly the rest of the sphere with its irregular diagonal panels. In this particular sphere operated by the Osaarians, only three of seven fusion reactors (each 12km long) are still operational. 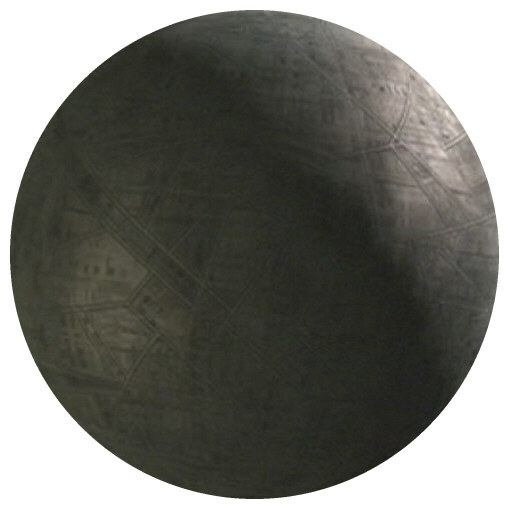 This sphere's additional portholes are made of polyduranium. 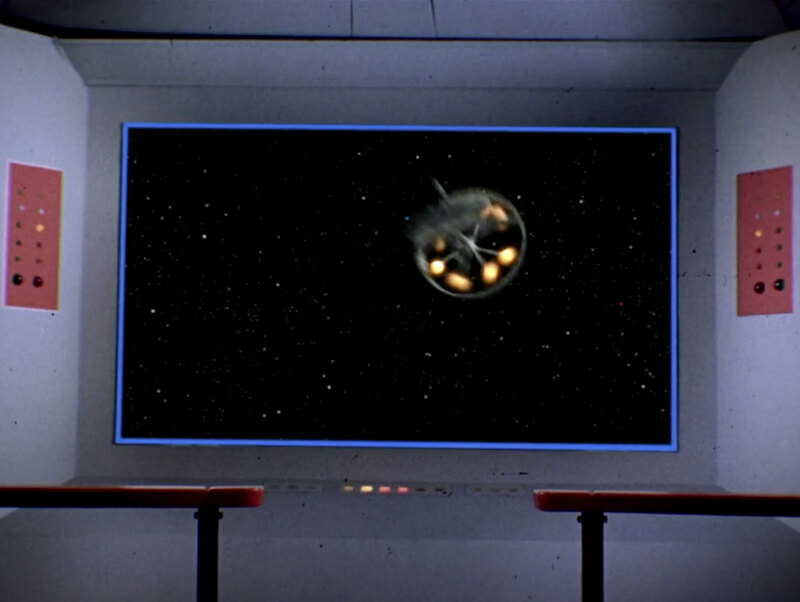 The first sphere appeared in ENT: "Anomaly". It was used by the Osaarians as a hiding place. They supposedly added at least one door to the sphere, although this door looked exactly like the rest of the sphere with its irregular diagonal panels. See also under Sphere Builders. 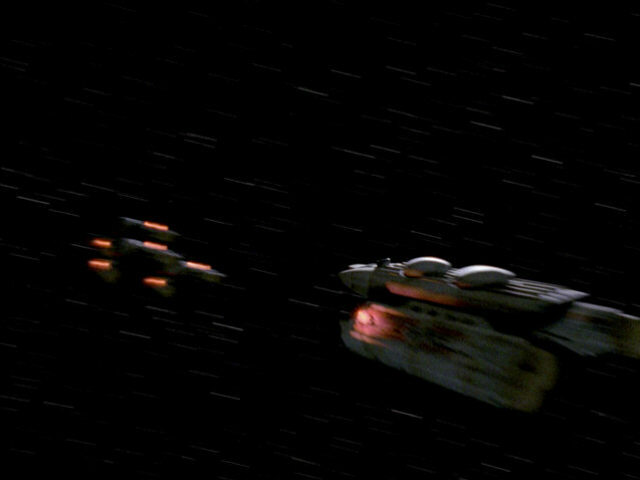 The Pakled ship is on a low technological level, but its weapons and shields have been considerably upgraded. The shields are of Romulan origin, some other parts have been taken from the Klingons and the Jarada. The Mondor could be seen in TNG: "Samaritan Snare". It was the first of several appearances of the studio miniature. In one take we can see a large cloud of bluish gas being emitted from the thrusters, obviously suggesting that this system is dated and ineffective. Data says about the vessel: "Basic early design. Capable of sub-light travel only." However, that doesn't seem to make sense, since the ship was found in open space. This small vessel is utilized by the inhabitants of the Beta Moon orbiting Peliar Zel II. 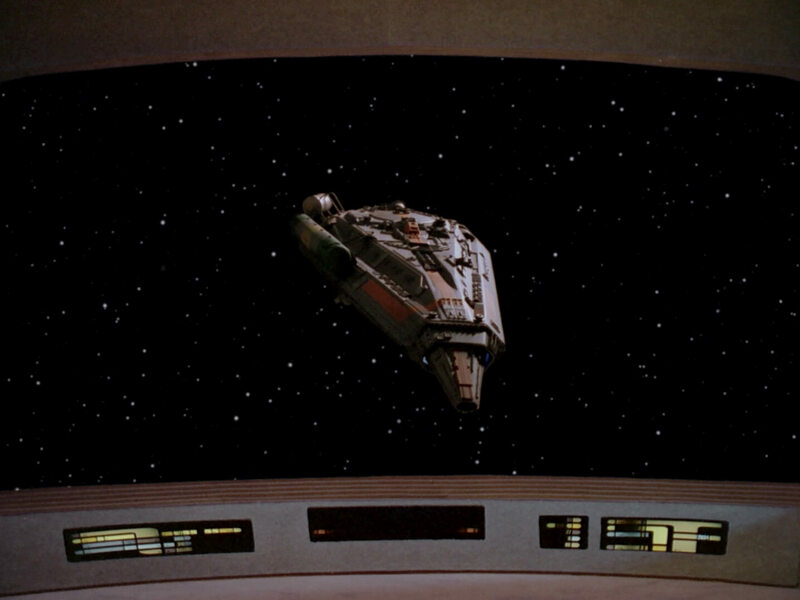 The Beta Moon vessel is yet another re-use of the versatile Merchantman from "Star Trek III" with very subtle changes. It would not be too far-fetched to assume that the inhabitants of the Beta Moon, like many other races, may have acquired vessels of exactly this type. The Xhosa is a freighter of Petarian registry, owned by Kasidy Yates. Many of its systems are regarded as outdated. As opposed to what has been stated earlier, the Xhosa miniature is identical to the Norkova except for the color. 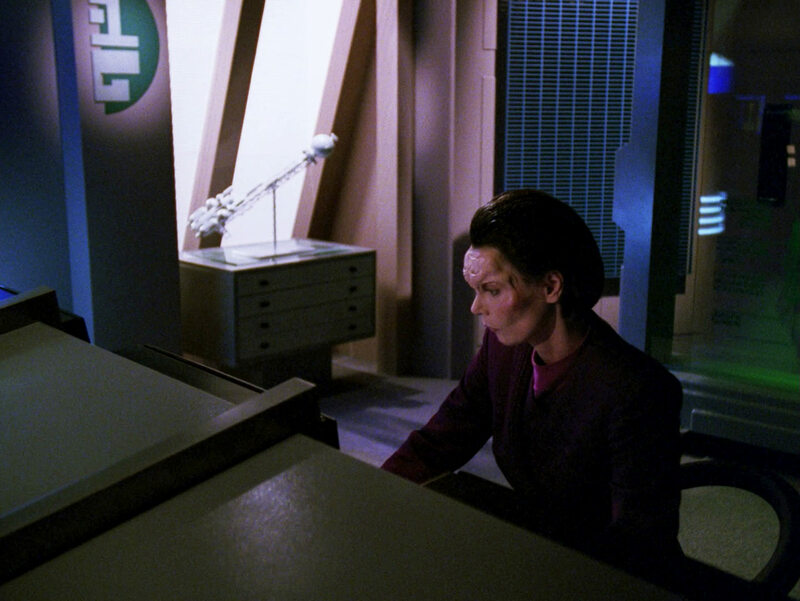 It is worth mentioning that the Norkova sported an interior like modern Federation ships, whereas the Xhosa's bridge controls looked much like those on the original Constitution class. This may be taken as evidence that both are originally Federation designs and belong to the same lineage. It is possible that the class name is indeed "Antares", but it is rather not an "Antares Class Cruiser" as mentioned on the Xhosa's dedication plaque. 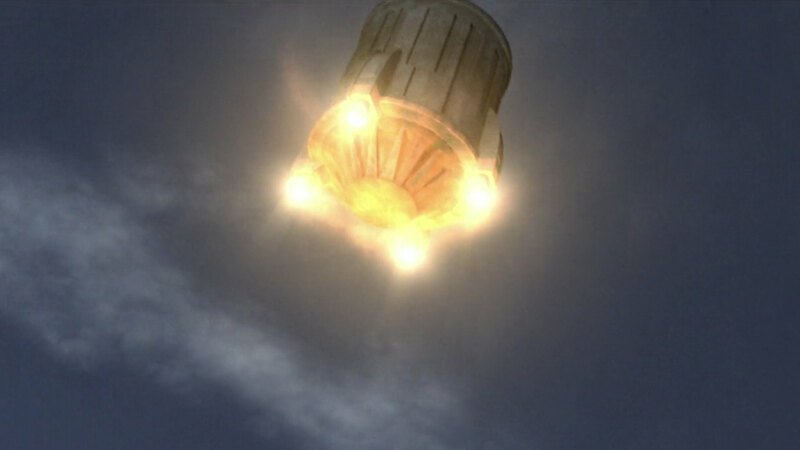 The Retellian escape pod is equipped with sublight propulsion and with planetary landing capability. The pod appeared in ENT: "Precious Cargo". It was also visible on Weytahn/Paan Mokar in ENT: "Cease Fire" where it may have been a simple transport container. The Retellian freighter is a small boxy ship, most likely unarmed. The Retellian freighter is a new model. But its construction principle with the cargo containers, the beak-like command section and most of all the inward nacelles is very similar to that of the ECS Fortunate. Save for the green color of the nacelles it would have been a perfect design for a human freighter too. Its maximum speed (just like of human ships) is in the region of Warp 2 (this was mentioned as the speed at which the ship escaped). Nothing is known about the Rigelian freighter. 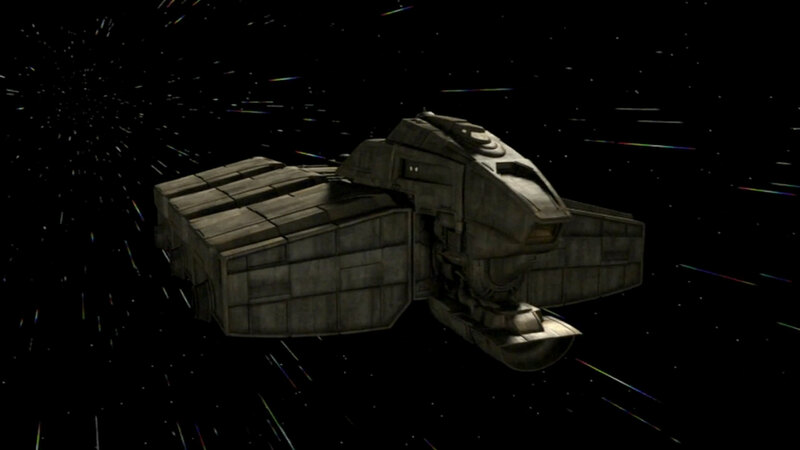 The Rigelian freighter seen in ENT: "Affliction" is the same CGI model as the Axanar freighter. The two real vessels could be easily the same design too. The Rigelian scout ship is said to be heavily armed, further specs remain unknown. 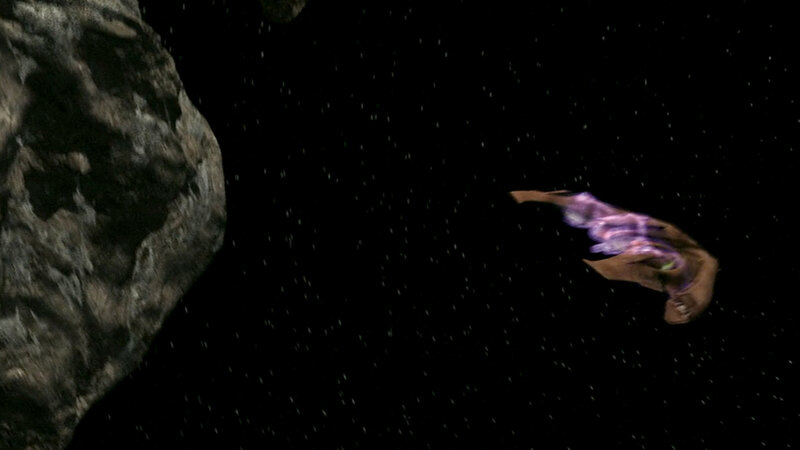 The Rigelian scout could be seen only in ENT: "United". It is the same design as the Hazari vessel from VOY: "Think Tank". 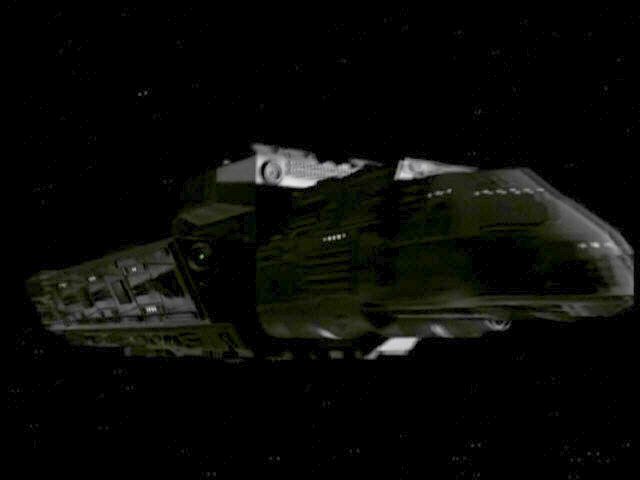 Interestingly such a ship had appeared in Enterprise before, in the survivor fleet in ENT: "Twilight". This may have been another Rigelian scout. See Civilian Federation Ship Classes for a Rigelian design of the 24th century.